I am about to finish mechanical engineering at UTS. In the past I have graduated IT and Landscape Design and Construction. I'm here to complement my part time maintenance business I have successfully ran for 7 years. I look after your home, garden, appliances, cars, etc, can do deliveries and more, I work on both residential and commercial projects. My work is fully insured, I have a Ute with tools and trailer for rubbish or removals. Old Frameless Shower Screen replace by new one. Karen S. said “Robert was very personable and arrived on time. He completed the agreed work and is probably the tidiest 'tradie' I have ever used. Is anyone able to setup my mums router tonight?? 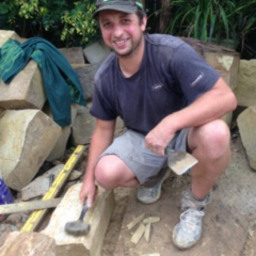 Attach pole to metal fence..
Devina R. said “Robert - was absolutely fantastic, punctual and did an expert in his trade - the job took him twice as long, as the land was on sandstone - he came back the next day and made sure that everything was at the correct height and perfect! Dustin H. said “Robert is a champion, and he knows his trade well. Came in a few days ago, took measurements, and did all the cutting work outside. He came in fully prepared and equipped with all tools. A 3 hour estimate ended up going close to 5 hours, and though he had a couple of setbacks, he just stuck on with it and got a great job done. Dane A. said “Definitely a Pro AirTasker. Thanks Robert for a thorough job, and for helping me out on short notice. Putting up shelf. Putting up mosquito net. Madeleine B. said “Great job, timely and efficient and easy to work with.